Pearl Harbor is a place of touchstones – of bravery, sacrifice, and loss. For visitors, it’s a place to learn, experience and honor. From a historical perspective, the tragic event that occurred at Pearl Harbor at 7:55 on the morning of December 7, 1941, “a date which will live in infamy,” was a single moment that changed history. America’s immediate reaction to the surprise attack by Japan on America’s naval base at the southern end of Hawaii’s island of Oahu, had a profound global impact. It ended America’s tradition of avoiding conflict, forced it into World War II, and established its position as one of the most powerful nations in the world. On that fateful day, the unrelenting Japanese air assault killed 2,388 Americans and wounded over 1,8200. It rendered America’s Pacific fleet useless. Five of eight battleships, three destroyers, and seven other ships were sunk or severely damaged, and more than 200 aircraft were destroyed. While these statistics help to understand the devastating magnitude of the loss, to be able to stand in the places where these events occurred is powerfully moving. Pearl Harbor, an active military base and home to the US Navy’s Pacific Fleet, has several important historic sites, most located on Ford Island, accessible to the general public via a US Navy shuttle from the Visitor Center. Allow at least 6 hours to fully experience the significant Pearl Harbor sites. This is your first stop. It’s the ticketing center, starting point of the shuttle to the USS Arizona Memorial and to Ford Island which is location of the Battleship Missouri Memorial, the Pacific Aviation Museum of Pearl Harbor, and the USS Oklahoma Memorial. Be sure to take the time to see the three free museums inside the Visitor Center filled with artifacts, maps, and incredible videos about the attacks, the vessels, and moving oral histories about the people who were there. No bags of any kind are permitted on Ford Island or at the Arizona Memorial. The Visitor Center has lockers to store bags, purses, and backpacks for a per bag fee. The USS Arizona Memorial is the most stirring and most visited of all Pearl Harbor sites. Accessible only via shuttle from the Visitor Center, the memorial is suspended above the wreckage of the Arizona, in the shallow harbor in which she exploded and sank on Dec. 7, 1941. Interred in the submerged wreckage are 1117 of her crew members. Seeing the Arizona’s rusty hull visible just below the surface of the clear blue water is a sobering realization. The occasional tiny droplets of oil you might see bubbling to the surface, the “black tears,” which continue to leak from the ship after all these years is incredibly moving. The entire experience is serenely beautiful. Allow 75 minutes for the 23-minute video, boat ride out and back and time at the memorial. Visiting the Arizona is free, but a ticket for an assigned visiting time is required. Ticket can be pre-booked, or take your chances on getting one of 1300 reserved daily for walk-ins on a first-come, first-serve basis. 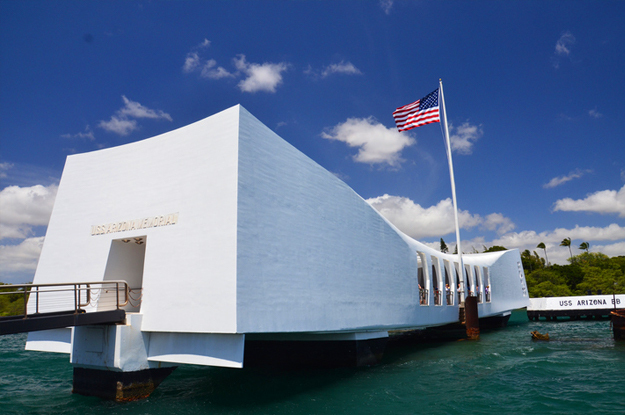 Trusted Tours & Attractions offers a great discounted narrated tour package aboard a comfortable motor coach which includes a pre-booked timed Arizona Memorial experience as well as touring through the historic district, passing popular Honolulu sights, and venturing up to National Memorial Cemetery of the Pacific. Go Oahu packages, also available through Trusted Tours & Attractions at a discounted price, including an Arizona Memorial Narrated Tour as one of many choices. Located on Ford Island, accessible only by shuttle from the Visitor Center, this battleship was the place where, while cruising in the middle of Tokyo Bay on September 2, 1945, the “Instrument of Surrender” was signed, officially ending WWII. There is a fee to tour this imposing battleship, whether guided, audio, or self-guided. Allow about 2 hours for the experience, including the 30 minute round trip shuttle ride. Trusted Tours & Attractions Go Oahu packages include the Missouri Memorial as a choice. Just steps away from the Missouri, the USS Oklahoma Memorial lists the names of the 429 Marines and sailors who lost their lives on the Battleship Oklahoma the day of the attack. The Pacific Aviation Museum of Pearl Harbor is another must-see on Ford Island, and well worth the entry fee. Allow 2 hours in this interesting museum to see the battled-damage airfield and control tower, and an incredible collection of vintage military aircraft and memorabilia housed in two WWII hangers. The museum is included as a choice in Go Oahu packages, available at a discount through Trusted Tours & Attractions. Next to the Visitor Center, the Bowfin Submarine Museum and Park has outdoor and indoor exhibits dedicated to the submarines in action during WWII. Being able to board the Bowfin, a WWII submarine dubbed the “Pearl Harbor Avenger” for its sinking of 44 Japanese ships, is thrilling. Experiencing what it must have felt like to live and work in such tight quarters while traveling underwater, is an eye-opener. The entry fee includes an audio tour. After your tour, take the time to walk the paths along the waterfront park to read the plaques describing each of the 52 American submarines lost in WWII. Plan to spend about an hour for the Bowfin experience, which is also a choice in Go Oahu packages available through Trusted Tours & Attractions. This serene and scenic cemetery, commonly known as the Punchbowl, is in the crater of a long-extinct volcano. Nearly 34000 American veterans, including nearly 800 who perished in the attack on Pearl Harbor, are buried in this unusual and peaceful expanse of green. Panoramic views of the city and Diamondhead and sweeping views of the ocean are spectacular. A good way to see city highlights, visit the National Memorial Cemetery and visit the Arizona Memorial, is on the 5-hour Pearl Harbor, the Arizona and Punchbowl Tour, a narrated 5-hour tour in the comfort of a large motor coach, offered at a discount through Trusted Tours & Attractions.